A new way of comparing the color andintensity changes of light reflected off of Earth's surface to the flickersfrom exoplanets may help reveal the presence of oceans, continents and ?possibly ? life on alien worlds. Researchers came up with a color scheme forhow our uniquely life-filled, ocean-soaked planet would appear to observerstens of light-years away. By comparing the changes in observed hues ofan alienplanet ?as it rotates to this distinct Earthly color palette, "we caninfer the surface composition of the [exo]planet," said Yuka Fujii, adoctoral student at the University of Tokyo and lead author of a paperpublished in the May 4 issue of the Astrophysical Journal. The method might let astronomers to soon huntfor soil, snow, seas or even plant life on exoplanets that for decades will otherwiseremain too faint to directly visualize. For today's mostpowerful telescopes, even a nearby exoplanet is nothing more than a pointsource of light teased out from the intense glare of its host star. Should asmall, Earth-like planet be discovered around another sun, astronomers will notbe able to simply look at it and pick out azure seas or verdant rain forests. The problem: the dearth of light particles,or photons, reflected by exoplanets that then reach across trillions of milesto our telescopes. 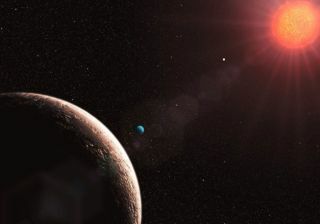 The next generation of proposed secondEarth-hunting instruments, such as the Terrestrial Planet Finder or the NewWorlds Observer, will similarly struggle to resolve much more than just anexoplanetary flicker. "It is hard to obtain enough photons from distantplanets for detection" of surface features such as vegetation, said Fujii. Yet these rare rays of light carry with themtelltale signatures, and astronomers have detected various gases in the atmospheresof giant exoplanets using spectroscopy. The new study suggests that enoughlight may be reflecting off the ground as well to be observationally valuable. "We cannot directly identify green, blueand red spots on the surface," Fujii said. "But we can observe thetotal color average over the visible surface of the planet" and compare itto Earth's known values to take a stab at the world's geology or even biology. Researchers used satellite data to model abaseline for "Earthshine," or the wavelengths of sunlight reflectedby major surface types on Earth, including oceans (which covers 71 percent ofthe planet), vegetation (14 percent), soil, such as deserts (9 percent) and snowand ice (3 percent). These types reflect different amounts oflight at certain wavelengths; snow, for instance, reflects more than 80 percentof light around 0.8 microns, while oceans bounce back photons in the low singledigits percentage-wise. As Earth (or an Earth-like exoplanet)rotates, greater and lesser expanses of these surface types come into view,changing the overall complexion of light reflected out into space in ameasurable way. In this way, astronomers can compare exoplanetarysheens to Earth's to come up with rough estimates for a patchwork of alien seasand savannahs, should they exist. The varying levels of light representingdifferent land forms are somewhat like the spices and ingredients in a soup, so"it's taking the total light, or the total taste of the soup, anddecomposing it into things we know about like soil in the way that a chef knowssalt or basil," said Ed Turner, a professor of astrophysics at PrincetonUniversity and a co-author of the paper. For their model, the researchers assumed a twinof Earth at a distance of about 30 light-years ? close by cosmic standards ?and a space telescope with a two-meter mirror observing for an hour a day overtwo weeks. "We assumed a fairly nearby planet, butstill had to stack the data for two weeks in order to accumulate a sufficientnumber of photons," said Fujii. The model relies on many oversimplifications.Clouds, for example, with their light-scattering and ground-feature-obscuringeffects, are not yet part of the equation. Alan Boss, anastrophysicist at the Carnegie Institution in Washington, also pointed out thatpaper ignores "the problem of separating the planet's light from thestar's light," perhaps the biggest hurdle in exoplanetary investigation. Spying blue skies and the red edge? But even in its preliminary form, thecolor-detection method shows much promise and Turner said he was "surprisedat how well it worked." The technique could detect both an atmosphereand an ocean simultaneously based on Rayleigh scattering, the light-scatteringeffect that makes our sky and oceans appear blue and that would similarly tintthe light from Earth-like exoplanets. Color comparisons to Earth could also revealthe so-called red edge. Plants on Earth have evolved to reflect sunlightin the infrared range that is not energetic enough for photosynthesis but wouldotherwise heat the plant up; when viewed in infrared, plain green plants are abrilliant bright red, said Turner. This signature would jump out in the straybits of precious light collected from an exoplanet, he added. Many astronomers think the red edge is thebest shot at detecting alien life (assuming these plants are colored likeearthly ones). "Looking for evidence of the red edge isan excellent means for buttressing the case that an exo-Earth might not only behabitable, but inhabited," said Boss. Webster Cash, an astronomy professor at the Universityof Colorado, said the color variation technique is "absolutely going to beuseful" in the years ahead. He pointed out that it could be paired downthe road with other recognized ways to sniff out so-called biomarkers ofextraterrestrial life, such as the detection of oxygen and other key gases in Earth-likeexoplanetary atmospheres via spectroscopy. For now, the Kepler spacecraft, in its ongoinghunt for habitableplanets around 100,000 stars, will not be able to see the red edge ordetect surface features because the instrument "has no color information ?all photons are the same for Kepler," Boss said. Though much refinement is needed for thecolor-based method, Turner said it could be adapted for use on futureterrestrial planet finding satellites that NASA and ESA are exploring.? "I think we're really on the thresholdof being able to study earthlike planets around other stars," Turner said. And as with horseshoes and hand grenades,when it comes to scanning an exoplanet's light for signs of life, closenesscounts. "If we happen to find an Earth-likeplanet much closer than 30 light-years, say eight, this would be a loteasier," Turner said.